I have written often before of my admiration of all things Paula Wolfert, but when I received a copy of The Food of Morocco, I had to wrap my head around it, and find the words to describe the enormity of Paula's lifetime work, encompassed in The Food of Morocco. I think no words of mine would do it justice just as the internet does not clue you in to the breadth and depth of this book and the spellbound photographic journey it takes you on. I love my preview copy, more accurately volume, so much that I decided to celebrate Food Wanderings' second blogiversary and offer The Food of Morocco, from me, as a giveaway, to one lucky reader. A token of appreciation for all your support, encouragemt and friendship over the past couple of years. It's been an incredible journey with many new friendships and bonds formed along the way! Jenn Garbee of the LA Weekly put it so eloquently in her Cookbook Review, Cookbook of the Week: Paula Wolfert's The Food Of Morocco, Now That's A Cookbook article. Last week I made this delicious Chicken Smothered with Tomato Jam from the poultry section. It was a toss between that and Chicken and Caramelized Quinces. I served it with the vibrant Orange and Grated Radish Salad with Orange Flower Water from the salad chapter. In the Bread Chapter I am intrigued by the Berber Skillet Breads and No Knead Middle Atlas Flat Bread. Thirtheen chapters in all with a super informative The Essentials of Moroccan Cooking, chapter two. Some surprising to me and tantalizing, Stone Ground Corn Grits for Couscous, Steamed Noodle Couscous and Barley Grits Couscous definitely makes me think outside the semolina couscous box. The list goes on and on, Confit beef and what I refer to as a Moroccan biscotti, double baked anise cookie, perfect for dipping into mint tea and for good measure a concoction of a Therapeutic Drink to Ward Off the Cold. Photos, recipes and preview copy courtesy of HarperCollins Publishers and Quentin Bacon's photography. Giveaway copy courtesy of Food Wanderings. 1. Please follow Paula Wolfert on twitter @soumak and on Moroccan Cooking FB page. 2. Please follow @foodwanderings on Twitter and LIKE Foodwanderings FB page . 3. Please RT this giveaway on Twitter or post on your Facebook page. 4. Drawing will be done randomly from all comments recorded by Wed., Nov. 16. at midnight. Maximum 4 comments each. 1. The day before: rinse the chicken thighs and pat dry; trim away excess fat. Slide your fingers under the skin to loosen it from the flesh. Crush the garlic and 2 teaspoons salt to a paste in a mortar. Mix with the pepper, ginger, olive oil, and saffron water, and rub under and over the skin of the chicken. Let stand, covered, in the refrigerator overnight. 2. The next day: place the chicken, with its marinade, in an 11- to 12-inch tagine set on a heat diffuser. Add the grated onion, cilantro, 3/4 teaspoon of the ground cinnamon, and 1/2 cup water and mix thoroughly with the chicken pieces. Cook, covered, over low heat, stirring once, for 20 minutes. then begin to slowly raise the heat to medium and cook, uncovered, for 20 minutes. 3. Add the tomatoes and the tomato magic or tomato paste to the tagine and continue to cook over medium heat, uncovered, turning the chicken pieces often in the sauce, until very tender, about 20 more minutes. Take the chicken out and wrap in foil to keep warm and moist. Allow the tomatoes to cook down until all the moisture evaporates, stirring occasionally to avoid scorching, about 1 hour. the tomatoes will begin to fry and the sauce will thicken considerably. 4. add the honey and the remaining 1/4 teaspoon cinnamon to the tomatoes and cook for several minutes to bring out their flavors. Reheat the chicken parts in the sauce, rolling them around to coat evenly. 5. Remove the cover, scatter the sesame seeds on top, and serve hot or warm. Recently I asked my daughter, Leila, to test this recipe, since she remembered it from her girlhood in Tangier. She was thrilled with the results, telling me that two of her friends liked it so much “they actually licked the bottom of the tagine pot.”For best results, make this dish, as Leila did, in summer, when tomatoes are at their peak. Please remember to transfer a hot tagine to a wooden surface or a folded kitchen towel on a serving tray to prevent cracking. Nearly all the recipes in this book that use saffron, add it in the form of saffron water—crumbled, dried, and crushed saffron threads soaked in warm water. Using saffron this way is economical, and it brings out more of the spice’s aroma and flavor than simply adding a few strands to a dish. In fact, I’ve discovered that if I soak all the ground spices called for in a recipe in a little saffron water before adding them to the dish, their combined flavors are intensified and better distributed. So, do as many Moroccan cooks do, and prepare a small jar of saffron water. Dry 1/2 teaspoon crumbled strands in a warm (not hot) skillet. Crush again, then soak in 1 cup hot water and store in a small jar in the refrigerator. This will keep for up to a week. For longer storage (my favorite method), quadruple the recipe quantities above; pour the saffron water into a plastic ice cube tray and freeze into cubes. Once they are frozen, shake out the cubes and store in a freezer bag. Each cube will be equivalent to 2 tablespoons saffron water or a good pinch of dried saffron threads. Thanks for the reminder to get the book at the book fair [J3's school]. I've been waiting for this book for quite a while and got distracted. My husband lived in Morocco for two years and used to hang out with the women in the kitchens wherever he lived so he could watch and learn to cook. And he does. We absolutely love Moroccan food and are fascinated by the culture (I also know many Jews of North African descent and have incorporated some of their recipes into my own holiday cooking). I would love Paula's cookbook. I have heard so much about it! One comment per? I tweeted the post and giveaway (and will stumble it, baby!)! You know I follow you on twitter! I also follow Paula Wolfert on twitter @soumak ! I was going to pick Chicken and Caramelized Quinces which sounds divine! But after reading the recipe I'm going to agree that Chicken Smothered with Tomato Jam is an excellent choice! And now following Paula on Twitter! Anyway, that is a book I have added to my wishlist and a marvelous recipe! Wow - this seems to be Giveaway week! I follow you on Twitter and Like Food Wanderings on FB, and the Chicken Smothered with Tomato Jam looks fabulous! What a nice recipe to celebrate this anniversary! It's a great choice, it looks great. I retweeted the giveaway! Can't wait to try this chicken. What a brilliant book of insight and useful tips. This is why I stalk you on Twitter obsessively, aside from my admiration of your brilliance. I've been follow Paula for quite some time now. I've had you on twitter and FB for a while now. This panda loves you! Happy Blogiversary btw, I tweeted about Paula's fantabulous book. Now may I have one please? A very happy 2nd blogiversary to you, Shulie!!! happy anniversary Shulie and many more to your delightful blog! I LOVE Moroccan cuisine and can have it everyday of my life and this recipe is just exquisite!! Congrats on your 2nd year of gorgeous blogging! I follow Paula on Twitter and like her FB page! I of course follow you on Twitter and like the Food Wanderings page! A friend recently made bread using saffron water and the aroma was incredible. 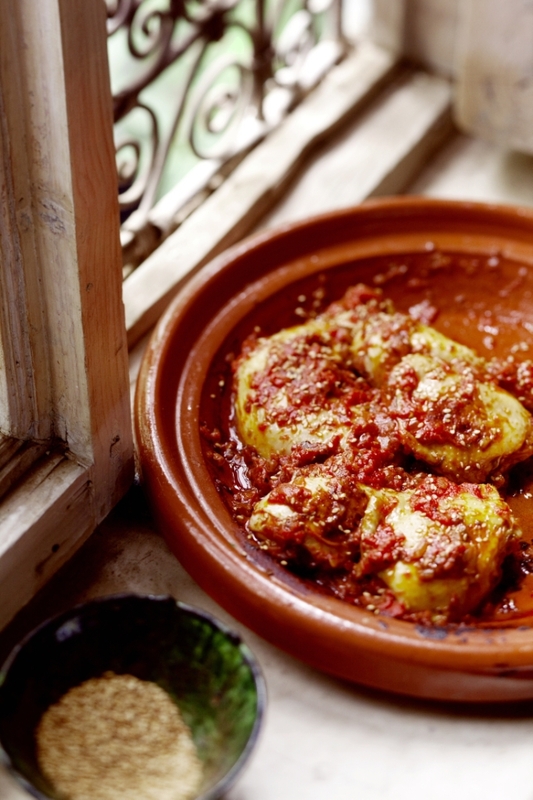 How would you cook this without a tagine? In a French oven? What a great recipe for chicken.And the book sounds amazing. I follow you and Paula already both on Twitter & FB. You are such food gurus, both of you! I am in awe ! Thanks for sharing! Hi Shulie! Gorgeous dish and photo - I seriously can't wait to try this! Following Paula, joined the group on FB and I of course follow you on Twitter! I have only recently become more interested in making dishes I might label exotic. Discovering some great ethnic markets has made all the difference. As I've opened my eyes to the possibilities I've also seen that some recipes, like this one...do not require regional specialty foods at all and that has probably been the biggest surprise of my learning curve. Looks and sounds absolutely wonderful! Congratulations on two years of blogging! It's not easy to maintain a quality blog for that long. May the future bring us all many more wonderful recipes from Food Wanderings! I love, love, love Paula's new book. Between the recipes and the photos, it is simply magical. Happy blog anniversary, Shulie. Enjoy! Those Berber Skillet Breads and No Knead Middle Atlas Flat Breads sound so good! Already following you on Twitter and Facebook. Fantastic post Shulie. This recipe looks amazing!! Happy Blogiversary! This looks like a great dinner and I love the sound of this book. I love Mediterranean cuisine and this cookbook about Moroccan cuisine would make a great addition to my collection. i love moroccan food and the flavors! i follow Paula now! already follow you on facebook too! I follow Paula on Twitter, but added her FB page. I've added you on Twitter (I'm @culinarylibrari) and on FB! shared this on FB. Thanks for the great giveaway opportunity! I spent some time in Morocco when I was 11 and fell in love with the food. I would love the opportunity to recreate authentic meals over here! I love Paula Wolfert! Her "Middle Eastern Cooking" was one of the first cookbooks I bought, about 30 years ago! It's a bit worn and stained, but I still have it! I've been drooling over her new cookbook! I want it!! Morroccan food sounds so interesting! I always like you on twitter and FB so I now joined Paula Wolfert and shared it on FB! I don't live in the US but I am so glad I have lots of cousins there :) Wish I could win it and get one of them to bring it to India when they are coming in December!! Nappy blogiversary, my friend! I wish you many more to come! And I adore Paula Wolfert. Yes, I would love to win the book! This looks so lovely! I am following you on twitter and will RT your giveaway there! I don't usually try for giveaways, but this is a book I would love (already have Wolfert's couscous book):-). I am a fan of your facebook page, tweeted the giveaway, have been following the Moroccan food group for months. Now all I need is a bit of luck! I love Morrocan food! Gave this post a thumbs up stumble! Happy Sunday! I just made the saffron water! I follow you on FB and Twitter. Following Moroccan cooking on FB. Thanks for the great review and recipe! My tagine can't wait! I followed Paula on Twitter and I love Morroccan cuisine and would utilize the cookbook to the fullest...Thanks!! !